When a long time Madison Indiana resident and history buff purchased the all brick structure that sits on main street but at the end of the parking area just across from the comfort station he had big plans for the small building. Constructed in the 1800s, the all brick building had originally been used as a horse stable for riders visiting madison in the late 1800s and early 1900s. In later years, until it was purchased, the building had been used as storage. Years of neglect and lack of maintenance meant that the leaking metal roof had caused serious structural damage to the rafters. The new owner of the historic building knew that many of the rafters and even the main support beams would have to be repaired along with the metal roof. 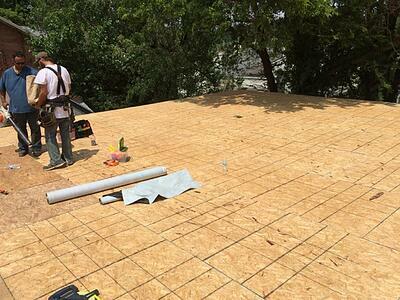 In addition to the major metal roofing project, the structure would need a lot of masonry repair work done and new framing for the carriage house style garage doors he had plans of installing. 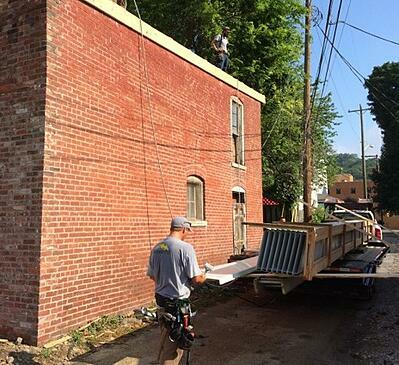 The historic restoration of the old building was going to be expensive so the owner enlisted Exterior Pro roofing of Madison to help navigate the pace grant program. The pace grant is a fund that is designated to assist building owners with repair and restoration cost associated with historic properties in Madison. The challenge of historic restoration and especially roofing projects on older buildings is to be as historically accurate as possible while still taking advantage of modern roofing products and manufacturing and installing advances. The existing metal roof on the building was a hand folded, standing seam or standing rib style. This type of metal roofing was often used on buildings in Madison and the surrounding southern Indiana towns because it could be fabricated on site from flat sheets of metal by old “timers” or sheet metal workers, it stands the test of time and holds up to Midwest weather, and can be used on lower pitched roofs such as the kind often found in historic districts. Exterior Pro researched several different metal roofing panels that would be suitable for the lower pitch of the building and then presented several options to the pace grant board director. What the group settled on and was willing to designate pace grant fund to was a modern day version of the old metal roof. The approved metal roofing would be 24” wide, it would be “mechanically" folded or seamed ( the use of small machine or manual crimper instead of being hand folded), and the standing rib would be approximately 2” tall just as the old metal roof. A flat pan or the space between the ribs would be flat and without striations to resemble being created from flat sheets of metal and the new metal roof would be “ hemmed” and interlocked just as the old style metal roofs had been. As close as the new metal roof was to the old, the new standing seam metal roofing would have several features that just weren’t available 100 years ago. 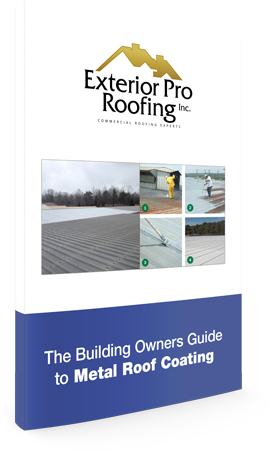 Such as the metal roofing panel begin manufactured to be full length of the building eliminated seams and the new metal roofing is also much thicker being 24 gauge. Add the Kynar paint job, new trims on the eves, and rakes and wa-la you have a historically accurate metal roofing project will all the bells and whistle of 21 century. The new metal roofing project took about a week to complete. 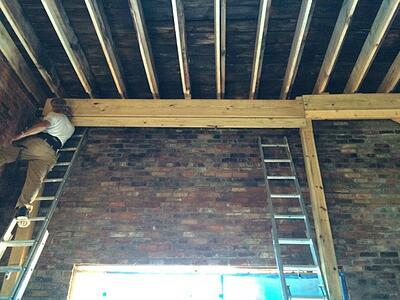 The water damaged rafters and beams had to first be repaired. It took over 17 new rafters to stabilized the roof. Then, it was on to removing the old metal, installing new plywood over the entire building and new synthetic underlayment. 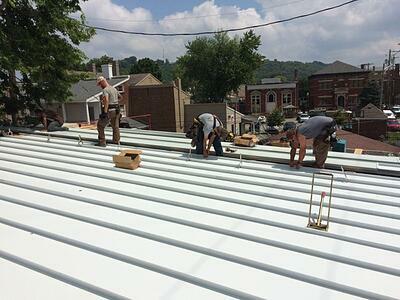 After several days of prep work the new standing seam metal roof went on quick and easy. Exterior Pro wrapped the sides of the garage and the gutter board and also hung a new 6” seamless gutter with two downspouts to carry away water. The building was dry and the new owner very satisfied. He got a great new metal roof and had help from pace grant to cover some of the cost. A job well done by Exterior Pro!